This mount adapter kit is compatible with Dual-T pattern universal smartphone and tablet holders (sold separately), including the Slim-Grip Ultra Universal Smartphone and Midsize Tablet Holder (SM060-2), Slim-Grip Universal Smartphone Holder (SM050-2), Slim-Grip Universal Tablet Holder (TAB001), Mega Grip Universal Smartphone Holder (SM040-2), and Mini Grip Smartphone Holder (SM015-2SLM). 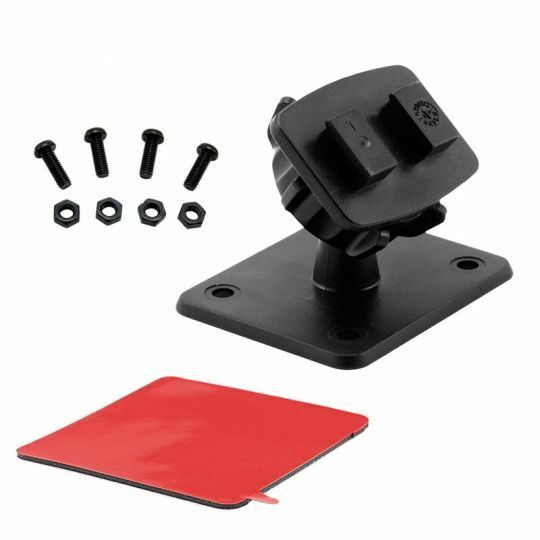 The mounting pedestal is also compatible with older model (2005-2009) Magellan RoadMate, Triton, and Maestro GPS units that feature the Dual T-Slot mounting pattern. This mount includes a low-profile pedestal with both adhesive and drill mount options. The mount’s swivel ball adapter head rotates 360°, providing the ultimate flexibility in positioning the device at any angle. The easy-to-install mount features tough 3M VHB adhesive to adhere to flat surfaces and can be used with vehicle-specific mounts, including those offered by ProClip and Pro.Fit. A screw pack is also included for a more permanent installation. Important: drilling directly into the vehicle body could cause permanent damage. Use caution and consult a mobile install professional to avoid drilling into any highly sensitive motorcycle components. Garmin GPS devices can also be mounted by simply unscrewing the swivel ball adapter and revealing the 17mm ball mount base.